Always put your baby on their back for every sleep, day and night, as the chance of SIDS is particularly high for babies who are sometimes placed on their front or side. You should always place your baby on their back to sleep and not on their front or side. Sleeping your baby on their back (known as the supine position) every night is one of the most protective actions you can take to ensure your baby is sleeping as safely as possible. There is substantial evidence from around the world to show that sleeping your baby on their back at the beginning of every sleep or nap (day and night) significantly reduces the risk of sudden infant death syndrome (SIDS). Once your baby can move themselves from their back to their front and back again by themselves, they will be able to find their own sleeping position. The first few times they roll onto their tummy, you might like to gently turn them back, but do not feel you have to get up all night to check. Give them some time to play on their tummy while they are awake to help their development, but make sure you supervise them while they are on their front. The best way to make sure your baby sleeps on their back is to do this from day one, and keep putting them to sleep on their backs for every day and night time sleep. It is also important that you keep the same routine for your baby, as babies who are normally slept on their backs but sometimes slept on their fronts are at a great risk of sudden death. My baby was born prematurely and slept on her front in hospital, is it okay to sleep her on her front at home as well? Some babies who were born very prematurely and spent some time in a neonatal unit may have been slept on their fronts for medical reasons. Remember that babies in neonatal units are under constant supervision. By the time your baby comes home they should be sleeping on their back. Babies may find it hard to adjust from a sleeping position they have been used to, so persevere and do speak to your paediatrician if you are concerned. Front-sleeping should only be continued for on-going medical reasons on the advice of your paediatrician. Is a baby sleeping on their back more likely to choke on their own vomit? Some parents worry that by sleeping their baby on the back they will be at a greater risk of choking on their own vomit. However, no research has found this to be the case, and we now know that babies are far safer sleeping on their backs. My mum says I was slept on my front and that was the advice then, why has it changed? Many parents will have been slept on their tummies as babies, as that was the advice before 1991. However, research has since shown that the chance of SIDS is much higher when a baby is placed on their front to sleep. We know that in the early 1990s, there were thousands of babies worldwide dying suddenly and unexpectedly every year. The reason the number of deaths is much lower now is due to the new advice being followed by parents, such as lying babies on their backs to sleep. My baby loves sleeping on his front, how do we change to his back without him waking up? We sometimes get calls from parents who say their baby prefers sleeping on their front. If a baby is given a choice, they may well prefer this position, but unfortunately it is not a safe one! This is why we encourage all parents to follow back-sleeping from day one. Getting your baby to stick to sleeping on their back once if they have tried sleeping on their front might be difficult, but is made easier if your baby is always put down to sleep whilst awake rather than allowing your baby to fall asleep in your arms. Keep going, they will eventually get used to it. Is sleeping a baby on their front better for babies with reflux? All babies should be slept on their backs unless there is medical advice saying something different. If your baby has reflux, or any other on-going health condition, speak to your doctor about the best care for them. You should not sleep your baby on their front unless you have been advised to do so by a medical professional. Will a sleep positioner help keep my baby on their back to sleep and therefore lower the risk of SIDS? There is no need to use any type of equipment or rolled up blankets to keep your baby in one position unless you have been advised by a health professional for a specific medical condition. 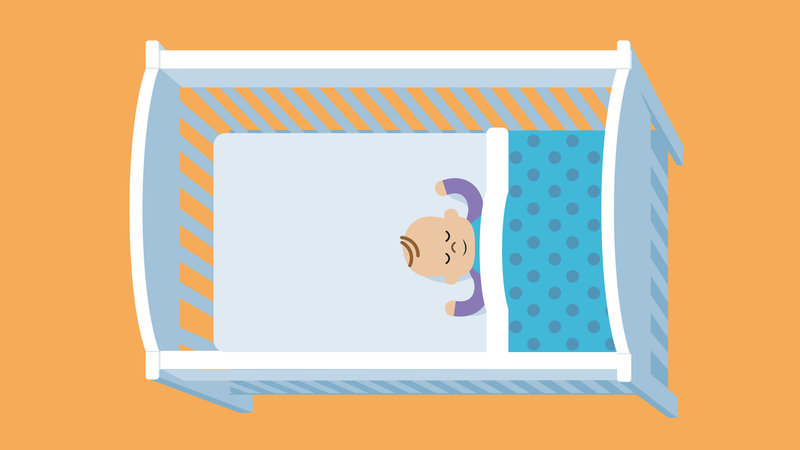 It is much safer for your baby to be in their cot with just the sheets or blankets, and no extras which could be pulled over their face or cause an accident. As babies grow stronger they learn to move and roll and this is fine. For more information, please read our clear cot advice.